The "Patagucci" and "Gooch" tags have undeniably been around forever when it comes to the perception that Patagonia gear is overpriced. And despite being a more than 20 year devotee to Patagonia gear, even I sometimes scratch my head regarding the cost of some items. One such item is the new Stromfront pack. How can Patagonia justify selling this for $275 when Simms sells the extremely similar Dry Creek pack for $130. Please explain without spinning. Thanks for your question Anonymous. The Stormfront® Pack may seem "extremely similar" to other packs but in my view it's really in a class of its own. The first point of differentiation is fabric. We use an 11.5 oz 420 denier plain weave nylon that has a burly TPU film laminated to each side. From my investigation Patagonia is the only one using this heavy duty material and finish. This is not a stock fabric and there is cost associated with engineering a custom material that can withstand extreme cold and heat while remaining supple and resisting fraying. Next let me highlight the #10 water and air tight corrosion proof T-Zip used for the pack closure. Nobody is using this option. Most of the competition uses a roll top and buckles or a standard coated reverse coil. Neither of these is billed as submersible. The Stormfront® Pack is. The T-Zip is also very easy to operate allowing for quick entry and a secure seal every time. The T-Zip alone costs about as much as some packs at retail. I do find it interesting that Patagonia seems to always get billed as "overpriced", especially in the fly fishing category where competitor waist highs can cost more than our best waders or waders with a zipper can cost over $700. 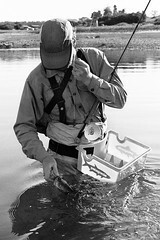 You can buy our best waders, boots and a Stormfront® Pack for less than certain competitors waders alone. The Stormfront® Pack costs about as much as many low end jackets and as stated, the Stormfront isn’t low end. The Stormfront® Pack is the Rolex of the category in my view and you can count on both luxury and performance. It has been tested around the globe in fishing, kite boarding and surfing situations. Keep an eye out for a Stormfront® Pack post on Way Upstream tomorrow with more detail and pictures. The Stormfront® Pack will be available in November and the production run will be limited. Thanks again for the question. I hope my reply doesn’t come across as spin. Your reply was what I expected, thoughtful, detailed and founded on facts. Thanks. Beyond the proprietary fabrics, extensive design and testing processes, premium zippers and deep financial support of grassroots conservation organizations, there is something else to consider when buying Patagonia gear: customer service. My first contact with the company was in the early 90’s when my prized “synchilla” fleece jacket, which I’d received many years earlier as a gift, was tattered and worn beyond recognition. Of course, it still worked great, but it looked like hell. I happened to see someone else wearing a newer one with sleeve cuffs made from a quarter-inch wide strip of stretch material. I called Patagonia on a whim and asked if they could retrofit my old rib-knit cuffs (which held water and had slightly irritated my wrists) to the new ones, which looked like they’d work great. The guy on the phone said “what color do you want?” I said, “for the new cuffs? I don’t care...” And he said, “no, I mean, what color new Synchilla jacket do you want?” I couldn’t believe it. But the brand new one arrived inside a week, and I’ve been a believer ever since. I was following this thread and had to chime in. I was associated with this project but i am not employed by patagonia. I respect that $275 is alot of money and that you should be discriminating if you are planning to spend it on gear. however i can tell you that this is a very unique product. And it is really and truly heads and tails above your referenced Simms products and other similar designs. this is one of those you get what you pay for items and Steve did a great job of impartially laying out the "features" . I think everyone looking at that price would be amazed at the actual costs involved and how much a Value Patagonia is actually bringing to the market with this item. the amount of thought , design , testing , testing , fabric testing, testing , and other vetting of this product coupled with the customer service aspect that Patagonia brings to the table it is a wonder they can offer this product at all and as you can see most companies don't, or should i say won't. from a user stand point this is easily the most useable and elegant design of its class. and i am really not trying to sell this in any way but Steve especially should get his due on sticking through the process to bring this to market, it was not easy. Thanks for the chime in JT. You know all too well how challenging it is to design and develop a product like this. I'm confident that the Stormfront® Pack has seen due diligence regarding the process. You should be proud of your design efforts on this one. Now let's see what the marketplace thinks. I'm off to the trade show in Denver tomorrow.